On Thursday night, Vancouver City Council voted to approve a rezoning application submitted by developer Concord Pacific to build 514 market residential units over two high-rise towers (27 storeys/235 feet and 21-storeys/185-feet) and 70 market rental units and a 37 space daycare within a “6.5” storey mid-rise building. The new multi-building complex at 445 Southwest Marine Drive will have a gross area of more than 455,000 square feet plus 411 underground parking spaces. However, the project has been a subject of controversy particularly for those who currently live in one of the 70 rental townhouse units of Marine Gardens: the existing complex, built as a “model community” demonstration project for the 1976 United Nations Habitat Forum, is to be demolished. Concord Pacific has proposed a Tenant Relocation Plan that will provide existing tenants with a first right of refusal to rent a unit at the new complex once it is completed and a 20 per cent discount on the first rent agreement. This is in addition to the offers of two months’ free rent, reimbursement for moving expenses and assistance with finding other housing. For households who do not intend on renting a unit at the development, they are eligible to receive $5,000 for living in the existing townhouse complex for less than three years and $8,500 for residing over three years. 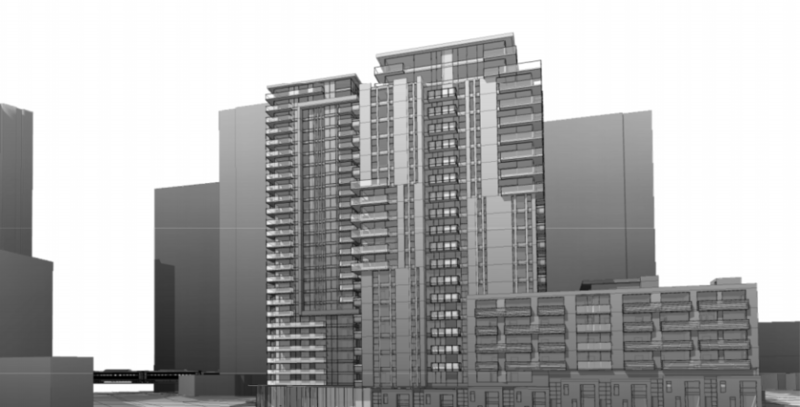 The Marine Gardens project adds to other proposals around Marine Drive Station including the 13 and 31-storey towers at Northwest, 26 and 32-storey towers at MC2, and the Marine Gateway mixed-used redevelopment. The Marine Gateway project is comprised of three towers, including 27 and 35-storey residential towers and a 16-storey office tower. The project will be a commercial and entertainment centre with a T & T Supermarket, Cineplex theatres, and space for restaurants and other retailers. 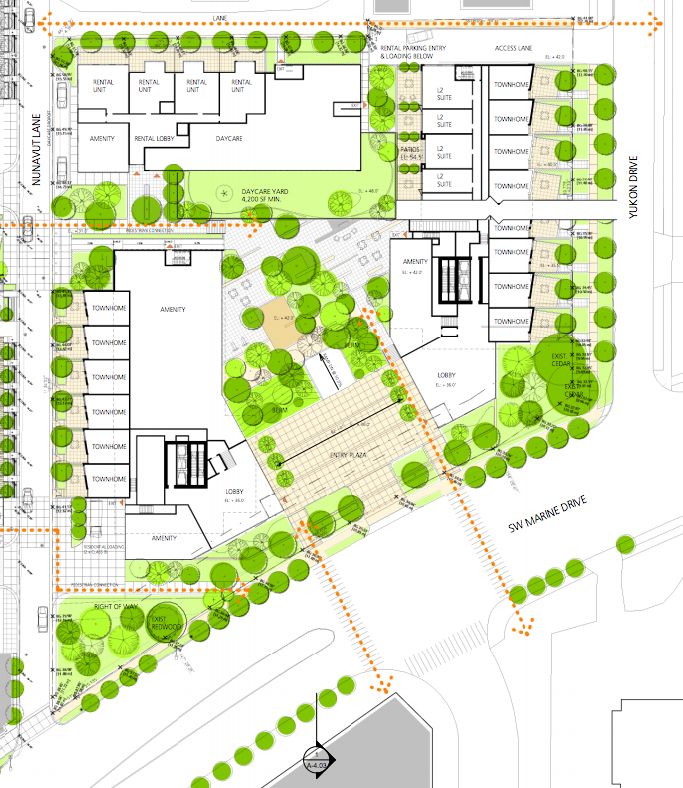 Aside from the growing hub at the SkyTrain station, major redevelopments are also anticipated for 57th Avenue at the Pearson Dogwood lands and 33th Avenue Station at the former BC RCMP Headquarters. Both redevelopments will likely include the addition of two new Canada Line stations within the immediate vicinities.